Hello and welcome back to another update of Forgotten Hope. More renders for you this week, as we show off the Churchill Mk IV and the guns of Pointe du Hoc. 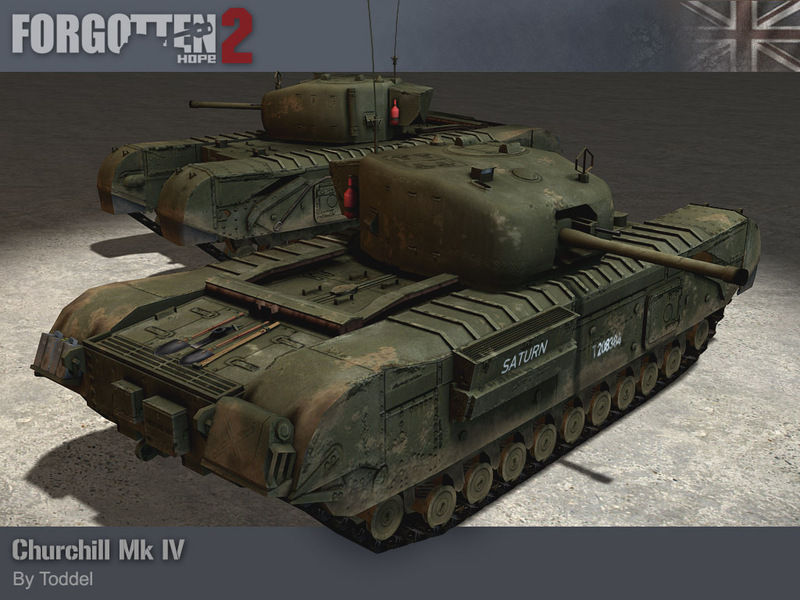 The Churchill Mk IV and its variants were modeled and skinned by Toddel. 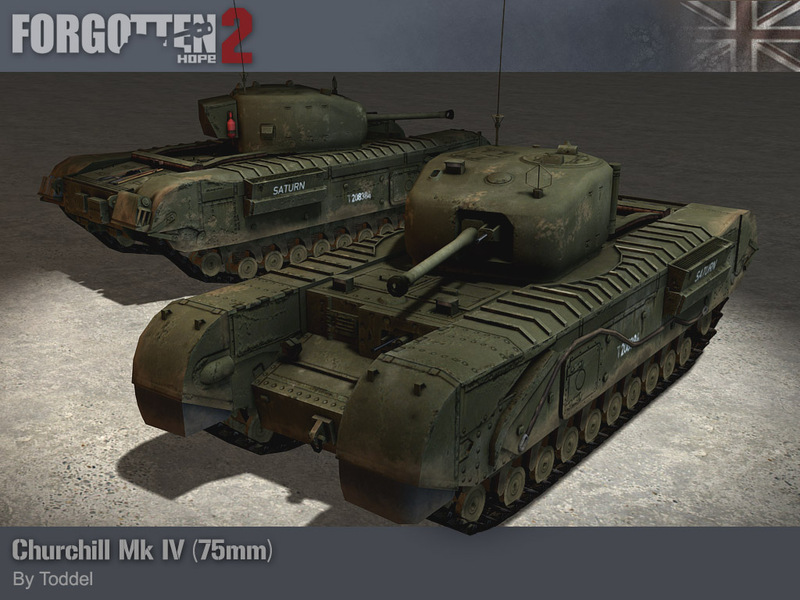 For the first two variants we have the Churchill Mk IV (armed with a 6-pounder) on the left and the Churchill Mk IV (75mm) (armed with a 75mm gun) on the right. The Churchill tank had already been specified before the outbreak of the Second World War, so it was still designed in accordance with the old British tank doctrine of cruiser tanks and infantry tanks. Being an infantry tank, the Churchill was designed to cross trenches, barbed wire and craters, while its speed and armament were secondary issues. The Churchill Mk I's poor performance during the Dieppe Raid almost caused it to be scrapped in favour of the Cromwell, but the great performance of the improved Mk III during the second battle of El Alamein showed the British command that the Churchill could be a great asset to the army. And indeed it proved itself again in Tunisia (even taking out a Tiger Tank) and again in Italy. Our Churchill, the Mk IV, was the most numerous variant of the Churchill, with over 1600 made, including various types. One such type is the 75mm Mk IV, armed with the same gun as the Sherman tank. Interestingly, this type started out with a field modification, where the original 6-pounder was replaced with the gun of a disabled Sherman tank. Although the 6-pounder was a better anti-tank weapon, the 75mm gun was better all-round. 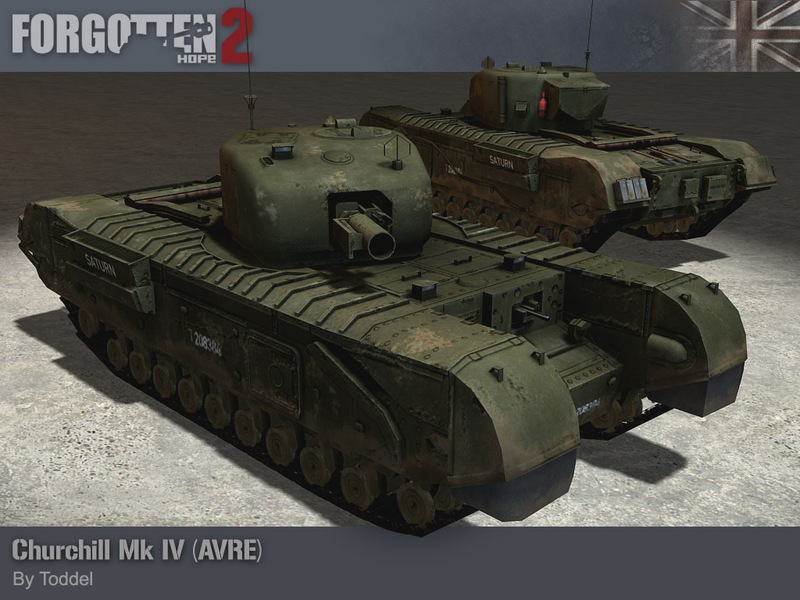 Another type of Mk IV Churchill is the AVRE, which we shall look at next. The Churchill Mk IV AVRE (AVRE standing for Armoured Vehicle Royal Engineers), was armed with a 290mm Petard Spigot mortar, which fired an 18 kg projectile, nicknamed the 'flying dustbin'. Although it was so big that it had to be loaded from the outside of the tank and only had a range of 140 metres, the AVRE could knock out enemy bunkers and roadblocks with ease. 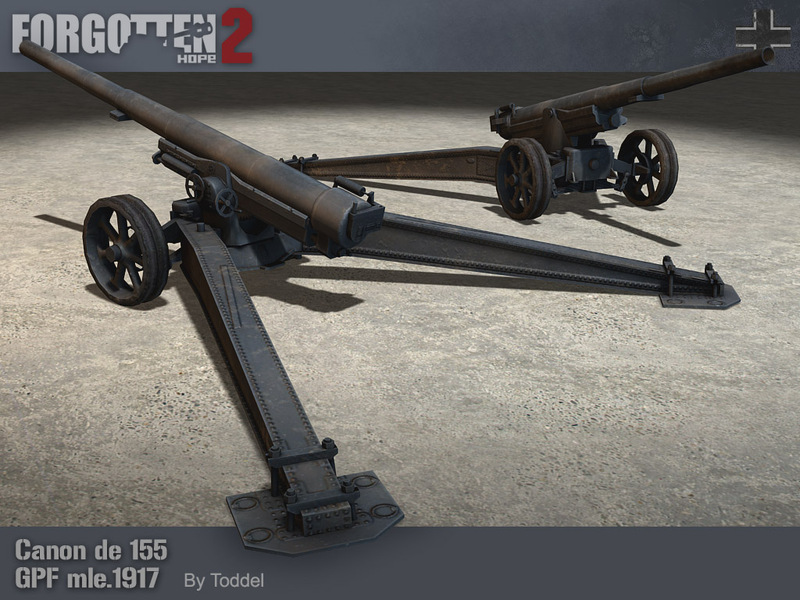 Finally, we have a render of the guns that were the focal point of the US Ranger attack on Pointe du Hoc. These guns were known to the Germans as the '15.5 cm K 418(f)', the (f) denoting that its previous owner was the French army. The French called these guns 'Canon de 155 Grande Puissance Filloux mle.1917', translating roughly into 'Filloux's very powerful 155mm gun, 1917 model'. (Filloux being the French army lieutenant who designed the gun.) This gun was also modeled and skinned by Toddel. These French guns were captured in 1940 and used by the Germans to strengthen the defences of the Atlantik Wall. The 6 guns that were to be positioned on Pointe du Hoc were in an especially dangerous position for the allied invasion. With a range of nearly 20 kilometres, these guns could strike anywhere on both Utah and Omaha beach. To deal with these guns, the US 2nd Ranger battalion was sent in. They landed at Pointe du Hoc, behind schedule, at about the same time the other American troops landed at the main invasion beaches. Using special rocket-propelled grappling hooks, they were able to scale the cliffs, in spite of German grenades coming down on top of them. When they had finally made their way to the top and defeated the German garrison they discovered that the guns weren't there. As it turns out, the Germans had decided to relocate the guns to a different position on June 4th, just two days earlier. Lucky for the Rangers, the guns were found, only 600 metres to the south of their original position, when they sent out patrols. Having destroyed the guns with their thermite grenades, their mission was accomplished. Hello and welcome back to another update of Forgotten Hope. 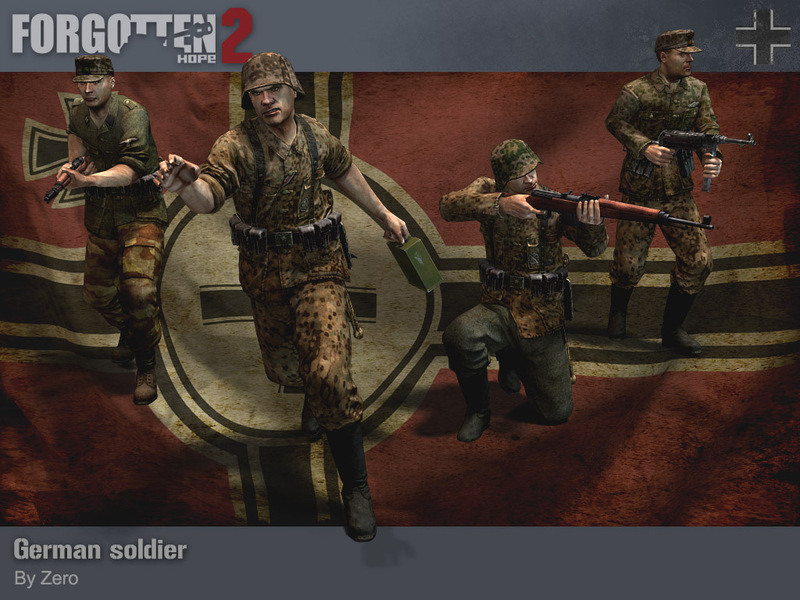 Today we have more amazing things, as we are showing the renders of the new German player models. 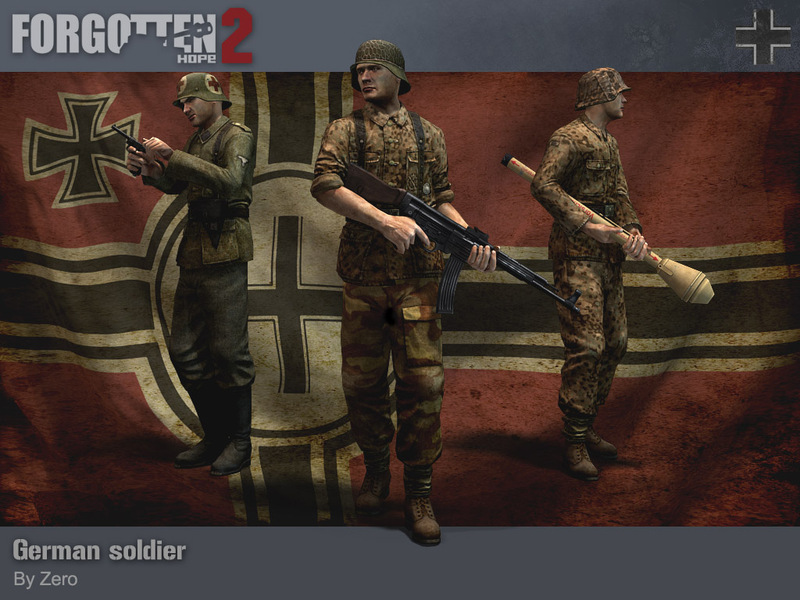 In our next release, we will have as many as 14 new German player models; one model for each class, both regular and camouflaged. First, we will take a look at the Heer player models. The Heer is the German name for the army. It is often confused with the Wehrmacht, which is the armed forces as a whole (the Heer, Luftwaffe and Kriegsmarine together). All these models were made by Zero. The state of the German Heer in Normandy differed greatly per division. Many divisions, especially the ones occupying the bunkers on the beaches, were static divisions. Their strength was often only two-thirds that of regular divisions and would not have any means of transport. 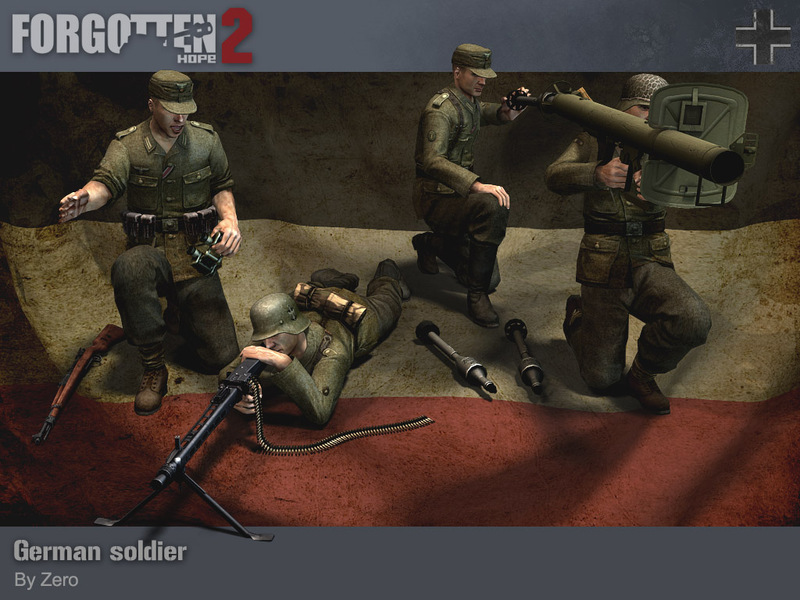 They were first raised in 1942 and in the two years that followed, its 'best' troops were sent to the eastern front and replaced by so-called 'Osttruppen'. These were former Soviet or Polish prisoners of war who chose to enter the German army, rather than being sent to concentration camps. Most of the German troops in these divisions were either quite old or really young. Other, regular divisions, such as the 21st Panzer Division, also had to cope with the needs of the Eastern Front. It was formed mainly of troops returning from Russia, who had already been turned down once or twice by other divisions who were in need of more soldiers. Most of its tanks were Panzer IVs, but it also fielded many converted French tanks. On the other side of the spectrum, we have the Panzer Lehr Division. It was especially formed in anticipation of the allied invasion and it was made up of the best units in Germany. All of its infantry regiments were fully mechanised (equipped with half-tracks) and most of its tanks were Panthers. It also had some 8 Tiger tanks and 5 Tiger II tanks. Up next we have the camouflaged player models. These models were also made by Zero. The use of camouflage in the German army began with the introduction of the Zeltbahn 31 - a sheet of canvas that could be used both as a tent and as a poncho. Much later, in 1937, the Waffen-SS started experimenting with camouflaged uniforms. These few uniforms would be used up to 1942, which saw the introduction of camouflaged field caps and helmet-covers. In 1943, the first of the new full camouflaged uniforms appeared, which were produced with many different patterns. 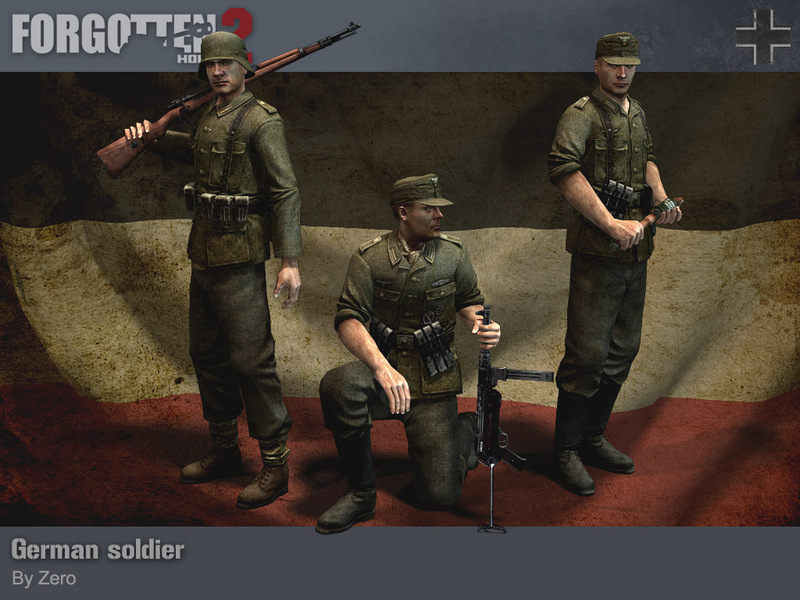 The dotted pattern you see on most of the player models is called the 'Erbsenmuster' or 'pea-pattern'.